A couple of months ago, I blogged a proposal for a tool I called dotdee. Based on the feedback I received here, in IRC, on the Debian dpkg mailing list, and at the Ubuntu Developer Summit in Budapest, I have vastly improved the implementation and cut a 1.x release series, which is now available in the Ubuntu Oneiric archive, and in ppa:dotdee/ppa for all supported Ubuntu releases! Juan Negron has already begun using dotdee in the Ubuntu Orchestra packaging (more about Orchestra very soon! ), so I thought I should probably put together a small how-to, such that you could start using dotdee too. The full manpage is here. This how-to is more of a set of sample instructions for you to try. You can read the initial proposal here. Basically, dotdee is a utility that allows you to take any flat file in your filesystem, replace it with a symlink pointing to a file that is generated from a ".d" style directory. Using inotify, the generated file is automatically and dynamically updated any time any file in the ".d" directory is added, deleted, or modified. To begin, you need to "setup" a file for management by dotdee. Here, we use dotdee --setup, we pass it the file to manage, /etc/hosts, and we optionally tell dotdee that the "#" symbol is the comment character in this file's format. $ sudo dotdee --setup /etc/hosts "#"
update-alternatives: using /etc/dotdee//etc/hosts to provide /etc/hosts (etc:hosts) in auto mode. That eventually points to /etc/dotdee//etc/hosts. Note that this file is read-only! This is to try and prevent inadvertent writes to this dynamically generated file. 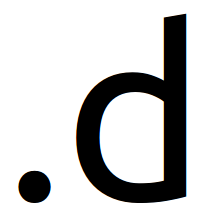 Moreover, since we told dotdee that the comment character is "#", dotdee added a comment to the top of the file for us. # DO NOT EDIT THIS FILE DIRECTLY! # per the dotdee(8) manpage. 50-original simply contains the original contents of the managed file. And .comment contains the comment string (#). But now, we can start adding information in this directory and dynamically update our /etc/hosts! Let's append the Google DNS IP address to our hosts, and see it immediately take effect. For this, we can create simple flat file at /etc/dotdee/etc/hosts.d/70-googledns. See our new entry at the end? sed is a great way to programmatically modify files or standard output. Let's use a sed script to remove blank lines from our generated /etc/hosts. Let's put this content in /etc/dotdee/etc/hosts.d/91-foobar.patch. Note that this file must not be executable, and must end in either a ".patch" or ".diff" extension. update-alternatives: using /etc/dotdee//etc/hosts.d/50-original to provide /etc/hosts (etc:hosts) in auto mode. Once you're comfortable with the above, you should be well set to use dotdee as an administrator, or as a packager. As I said above, Juan is using dotdee in the Ubuntu Orchestra packaging now, to generate and manage a file, /etc/puppet/manifests/site.pp. He uses debhelper to install a header and footer for the file. And now, he can insert as many puppet snippets in between the header and footer of site.pp, as necessary, from other packages! I'm quite interested in hearing your questions and comments! A number of people have asked about Augeas, and how the two projects might be similar. They are similar in that they're both tools usable by system administrators to more programmatically interface with configuration files. I think they differ quite a bit after that. dotdee is extremely small, fast, and simple. It's not specific to configuration files, and could actually work against any file on the filesystem. It's completely agnostic to the format of the file, whereas Augeas is a library/API that must understand the particular configuration file type. I'm hoping that dotdee will be usable by Debian/Ubuntu packagers to improve some configuration file handling, in the long run! Do you have a bzr/git repo somewhere? I didn't see any software projects tied to the dotdee team in launchpad. I would like to look into extending this to be usable on a user level (~/.dotdee). I currently use a similar but manual process using make for things like muttrc, offlineimaprc, etc. Looking forward to the patches!